Not so many years ago, many people earned their livings by doing physically demanding activities and certainly had to do some walking on most days to get to and from work. Nowadays, more and more people work at a desk, often behind a computer and walk no further than to and from the car park. Working in an office can play havoc with your posture and bad posture can have an adverse effect on your health. Poor posture can result in headaches, wrist, neck and back pain, loss of concentration, fatigue, digestive upsets, stress and a general loss of productivity. Chronic back/ neck pain can also have a seriously negative effect on your mood, and because it’s chronic and just goes on and on, it’s easy to assume that you’re a moody, sullen, ill-tempered you-know-what by nature – which you’re really not. And if you’ve suffered with chronic pain long enough, it becomes as normal as breathing. Apart from the impact on health, poor posture also affects appearance, making you look older and heavier than you actually are. Sit or walk with good posture and you instantly looker younger, stronger and slimmer, you’ll also look more confident, in control and way more graceful. And last, though by no means least, it might just help to shake off that persistent, energy-sapping, mood-killing back or shoulder pain. 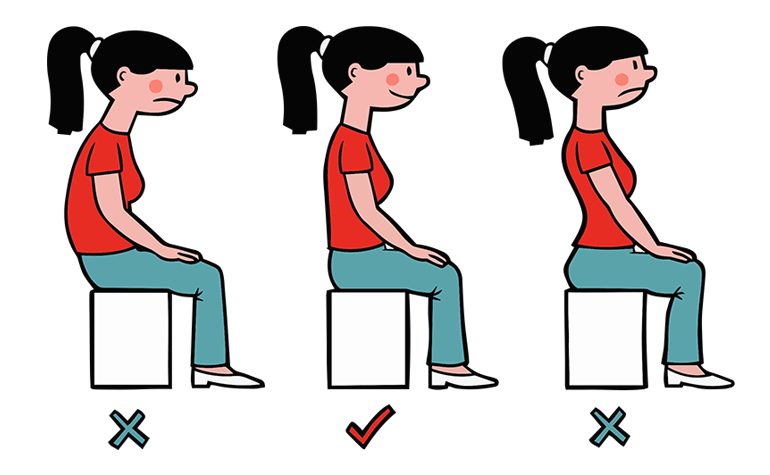 Be more posture-aware and enjoy all incredible benefits from something as simple as sitting up straight! In good posture, your joints are aligned in such a way that they are not exposed to additional wear and tear; your center of gravity is over your base of support and very little energy needs to be expended to hold you in the right position. For example, in good posture, your head and your neck is long is up which places very little stress on your neck muscles. Conversely, bad posture places stress on structures that don’t like to be stressed, uses excess energy and can also lead to discomfort and even pain. For example, craning your head forward toward a computer screen stresses your neck muscle and the cervical joints in your spine (see image above!). If you care about your health and your appearance, you need to care about your posture too! Chair – your chair should be adjustable so you can set it to the correct height. Ideally, your feet should be flat on the ground, your shins vertical, your thighs parallel to the floor and your lower back supported. If your feet do not reach the floor, use a footrest. Your seat and desk height should allow for a 90-degree bend at the elbows when typing. Your seat should also be padded enough to allow for easy blood circulation and made of breathable fabric – not plastic. Any arm rests should not impede your movements. Your chair should also have castors or wheels for easy movement. Desk – your desk needs to be the right height so that your arms are bent to 90-degrees when typing and large enough that you have easy and unrestricted access to all the things you need to use – no awkward twisting or reaching required. Knee space should be sufficient so that you don’t have to contort your legs to get your knees comfortably under your desk. Computer – your computer screen should be directly in front of you and the top edge of the computer should be level or slightly below eye level. For this reason, laptops are not ideal for extended desk use as the screen is inevitably too low. If you have to use a laptop, consider raising your machine on a box or laptop stand and using an external keyboard. Your screen should be 18 to 24-inches away and free from glare and shadow. Your keyboard and mouse should be within easy reach and near the edge of your desk, no higher than 2.5-inches above desk height. Your arms should be bent to between 90 and 100 degrees with your upper arms more or less vertical when typing or using your mouse. Your wrists should be mostly straight – use a wrist rest if this is not the case. Telephone – if you spend a lot of time on the phone, you should use a hands-free kit or headset. Do not hold your phone between your ear and shoulder for long periods of time. Setting up your workstation may require some effort from both you and your boss. If you meet any resistance to your request for an ergonomic workstation, politely remind your boss or human resources department that ergonomic workstations can actually save a lot of money due to lost productivity and sick days. A comfortable, healthy employee is a happy, efficient and productive employee! Now your workstation is set up properly, you also need to take an active role in protecting your posture. Good posture starts with your position of your head – where your head leads the rest of your body follows. Keep your neck long and avoid craning your head forward to see your screen. If you find yourself doing this a lot you may need to consider prescription glasses. Imagine there is a balloon attached to the top of your head gently lifting your head up and into good posture. Keep your ears over your shoulders. Speaking of shoulders, make a point of keeping yours down and back. It’s all too easy to let tension creep into your shoulders which can have an adverse effect on your posture. Your lower back should be very slightly arched to preserve your natural spinal curve. If you find this difficult, make sure your chair has adequate lumbar support. Keep your feet flat on the floor and your shins vertical. Maintaining good posture can be hard – it takes effort and it’s all too easy to slump back into bad posture if you are tired or have habitually bad posture. So if you can, periodically stand up and take a quick walk or stretch to break up long periods of sitting. If possible, try to take a brief break every hour or so. [quote_right]Poor posture is caused by one of three things – bad habits, tight muscles and weak muscles. [/quote_right]Poor posture is caused by one of three things – bad habits, tight muscles and weak muscles. Bad habits can take a while to break but by following the tips in section two, you should now be aware of what constitutes good posture and know what you have to do to break your poor posture cycle. It will take practice but you can learn better posture. Unfortunately, structural issues like tight and weak muscles are a little harder to fix and will require more effort on your part. To remedy these tight muscles, you need to stretch. A couple of stretches a week after your regular workout will not be enough. If you want to improve your flexibility and fix your posture, you need to stretch more often. Try to break up long periods of sitting with stretching to undo the tightening effect of spending long periods sat at your desk. You can stretch most of these muscles while at your desk and they only take a moment to do. When it comes to stretching, little and often is the best approach. These muscles become weak because, when you spend a long time sitting, they are in a stretched position which basically forces them to relax and lose tension. Spend enough time sat down and these muscles start to “switch off” and stop working as well as they should. Once they become weak, these muscles are overpowered by their stronger, tighter counterparts and are unable to resist the pull of gravity. Strengthen these muscles by hitting the gym a couple of times a week or working out at home with resistance bands.